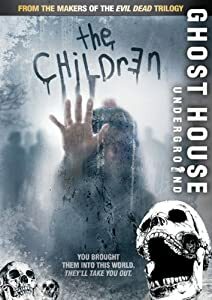 There were sixty horror films released in 2008 so it is not surprising that yet another low budget Brit-Horror got short shrift from the viewing public. 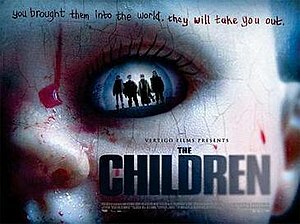 That is a shame because The Children is a cracking film that is relentless in piling on the pressure and making you feel increasingly uneasy. Directed and co-written by Tom Shankland (with Paul Andrew Williams ) The Children is about two sisters and their families who get together in the country to celebrate Christmas. Sister Elaine, played by Eva Birthistle has brought her two children and new hubby Jonah (played by Stephen Campbell Moore), Elaine’s oldest daughter Casey (Hannah Tointon) is a teenager from Elaine’s first marriage who doesn’t like her new step-dad or her step sister and would really rather be out with her friends. Elaine and her smarmy second husband Jonah are the modern couple. Jonah speaks Chinese and is teaching Casey’s little sister how to speak the language. Elaine’s sister Chloe (Rachel Shelley) and her husband Robbie (Jeremy Sheffield) live with their three children in a huge house. Every inch a “new-age” couple they treat their children with a “Dr Spock” mentality and don’t like vaccinations or modern medicine. Chloe and her husband are very laid back and casual parents and as an aunt and uncle they are the kind every kid in the world would like to have. They are almost the polar opposite of Elaine and Jonah. Elaine and her little family arrive at her sister’s spacious house at the start of the film. We get a short introduction to all the players in the film. At the first meal in the house it turns out that Elaine’s youngest child has some sort of cold. Elaine explains that something must be going around. Chloe is very annoyed that Elaine thought it was okay to bring a sick child into the house on Christmas. We find out that Chloe is something of an “Earth Mother” she doesn’t believe in giving her children inoculations against the common childhood diseases. She also home schools her kids, apparently in a bid to keep her children away from the other ‘diseased’ kids. After an unsettling night, everyone goes out in the snow to play and sledge down a hill conveniently across from Chloe and Robbie’s house. Casey takes little part in the festivities, choosing instead to phone her mates and arrange to meet them so she can leave. The second night is even more unsettling than the night before. Chloe and Robbie’s pet cat disappears. The younger children have all been acting strangely since their day outside and they seem to have some sort of cold. Chloe has another go at Elaine. The next day Robbie has gone out with the kids to play on the hill again. Casey has gone to meet her friends, She finds a bloody cat collar in the woods; while she is waiting for her friends she hears screaming and she runs back to the hill. Once there she finds that Uncle Robbie has been killed in a horrific accident. The sledge he rode down the hill has crashed into the play tent at the bottom of the hill and his head has been cracked open by a gardening tool. Unfortunately we know that this was not an accident. When the children started exhibiting cold symptoms they also started exhibiting some very strange behaviour. This behaviour soon turns murderous. Amazingly the parents either don’t act or act too late to save anyone. Casey is the only proactive member of the group. This film does more to argue the case of children getting vaccinations than any pamphlet I’ve ever seen in a Doctor’s office or school. It is never divulged in the film what has turned the little children into homicidal maniacs but it does show how ineffectual the average grown-up is in handling it. Despite being one of the best Brit-Horror’s of 2008 it did very poorly at the box office. It was not because the film was a low budget production, it definitely did not look like one and the acting in the film was very high calibre. I think the reason the film did so poorly was because it dealt with violence to children by adults. Never mind that the little buggers had just gotten a huge dose of an evil virus. Never mind that it looked like they were going to kill everyone over the age of thirty. Never mind that it was just a film. It is very hard for the average film goer to respond well to violence against children. So if you can’t bear to watch evil kiddies hurting and killing adults and have the same done to them, do not watch this film. If, however, you have the ability to recognise that this is a well made, brilliantly paced film, don’t miss it.